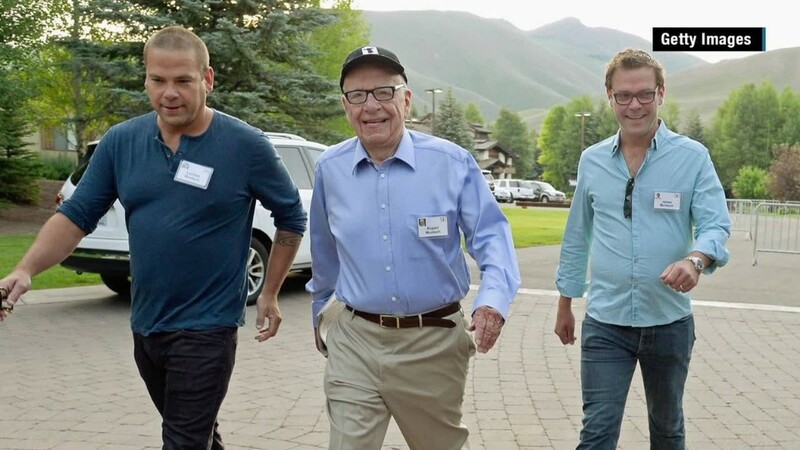 Rupert Murdoch's sons James and Lachlan will formally take control of 21st Century Fox on July 1, the company said Tuesday, confirming the timing of a plan that was first announced last week. James will become CEO and Lachlan will become executive co-chairman. The elder Murdoch, 84, will also be executive co-chairman. The effect of the moves is a power-sharing arrangement. "In conjunction with these changes, the company's corporate functions, and its global television and film operations will now jointly report to Lachlan and James Murdoch," 21st Century Fox (FOX) said after a board meeting. A Fox spokeswoman confirmed that this new reporting structure will include Fox News, the company's hugely successful cable news channel. Last week Fox News chairman Roger Ailes said he expected to continue reporting directly to the elder Murdoch. The spokeswoman said "Roger will report to Lachlan and James but will continue his unique and long standing relationship with Rupert." Sources close to the family said last week Rupert would remain actively involved in running the company with James and Lachlan. And Rod Eddington, the company's lead board director, affirmed that on Tuesday, saying that the sons will be "working in tandem with Rupert." The CEO shift is historic given Murdoch's media moguldom. "The long era of Rupert Murdoch leading News Corp and more recently 21st Century Fox as CEO seems finally to be coming to an end," MoffettNathanson senior analyst Michael Nathanson said last week. Tuesday's announcement marked Rupert's first public comments about the succession plan for his family's global media empire. "Lachlan and James are each talented and accomplished executives and together, we, as shareholders and partners, will strive to take our company to new levels of growth and opportunity at a time of dynamic change in our industry," Murdoch said. The cooperative arrangement is noteworthy because there have been tensions between the brothers in the past. "They're competitive with one another," longtime Murdoch watcher Sarah Ellison, a contributing editor at Vanity Fair, said on CNN's "Reliable Sources." She added, "I hope for their sakes that it really works, that they have a complementary partnership." On Tuesday the company distributed a joint statement from James and Lachlan. "We are both humbled by the opportunity to lead, with our father and the talented team of executives at 21st Century Fox, this extraordinary company," the brothers said. Ellison said of the new arrangement, "Lachlan is not above James. James is not above Lachlan. They're just going to share the power and the father is going to be there to sort of call the shots." But, she asked rhetorically, "Who breaks the tie? Well, Rupert breaks the tie. But how does that actually work going forward is hard to know."